he golf club is situated on a coastal hill in Mortehoe creating the perfect vantage point for fantastic countryside and sea views. The golf course a challenging 18 tees of shortish play that will test your iron skills with a course record of 66 strokes (level par). A high standard of course presentation makes it a pleasure to walk even if your golf is a little below par! 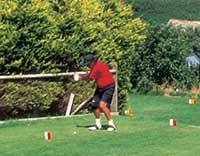 It's a great place to play golf or take a golfing break or holiday in England. Affiliation to the English Golf Union and Devon County Golf Union ensures excellent standards throughout the golf course. Traditional green keeping methods, outstanding natural drainage and turf care maintenance equipment mean year round firm, fast and true greens and excellent fairways.